A rose is just a rose…unless it’s rose gold! Wow! 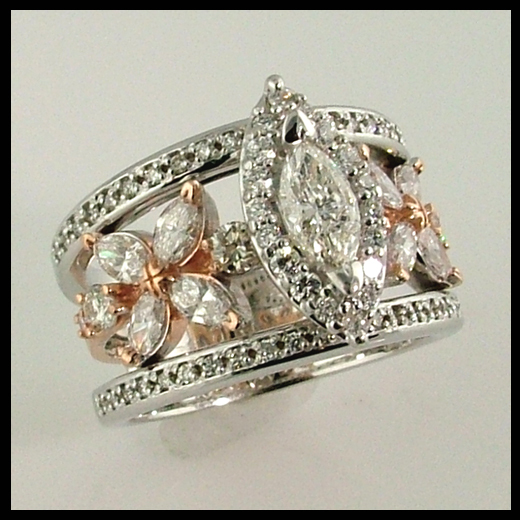 A stunning 14k white and rose gold diamond wedding ring restyled from old jewelry. It must be spring – because it’s definitely coming up roses at Scott’s Custom Jewelers! Rose gold, that is. Like most things, jewelry trends start on the coasts. Slowly, but surely the latest looks creep towards the Midwest. By the time they get to us, they are tried and true. And easily adopted. We’ve been doing quite a few jewelry pieces in colored gold lately, with rose gold being the favorite. 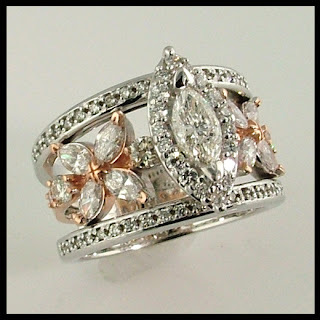 It’s soft blush looks great on every skin tone, and is especially beautiful with white gold and diamonds. Cheryl came to us recently with a “bag of opportunity” – old jewelry pieces she no longer wore, and a vision of what she wanted in a new, restyled wedding ring. It had to be wide, but not tight. Delicate looking, but not light weight or chintzy. And she really wanted to use her original engagement diamond, a marquise. Because we women are sentimental. After several version using our state-of-the-art CAD (computer aided design) technology, we settled on a beautiful, organic vine-shaped center insert, using her small marquises and round diamonds, set in rose gold. The original center diamond was “boosted” by a custom double halo that made it look ginormous. Like 6 carats huge! To top it off, white gold rails of diamonds framed the band, giving it a wide look, but not heavy. The result took everyone’s breath away! And even though Cheryl had seen several 3D pictures of the custom jewelry design, and had even tried on a painted model of the piece, the real thing was amazing. And I must brag a little – we at Scott’s Custom Jewelers own rose gold. Because we do everything from designing to casting in house, we have total control over the quality, every step of the way. And our rose gold rocks. Not too brittle, not too brassy, it’s the perfect shade of pink. With results this beautiful, I think this trend is here to stay.